Too busy for new business? It’s time to consider growth. Laws regarding concealed carry, open carry, castle doctrine, transport of firearms. Businesses ability to regulate firearms. A hands-on course. Discover the importance of properly waterproofing a custom tiled shower. What is the uncoupling principle (Tile floor underlayment)? Learn how to prepare a floor to receive a tile installation. Discuss the profiles for tile transitions and edge protection and learn about the alternative to bullnose tile and a protective edge for long lasting installations. Industry pros from Kohler Co. discuss the latest in product innovation in Kitchens and Baths. Discover innovative product and how to match it with pre-existing exteriors. LEAN is a method of continuous process improvement based on the relent pursuit of eliminating waste in any process. Having its roots in manufacturing, LEAN is now a proven tool for improving processes, increasing customer satisfaction, enhancing employee morale and reducing costs in service industries. 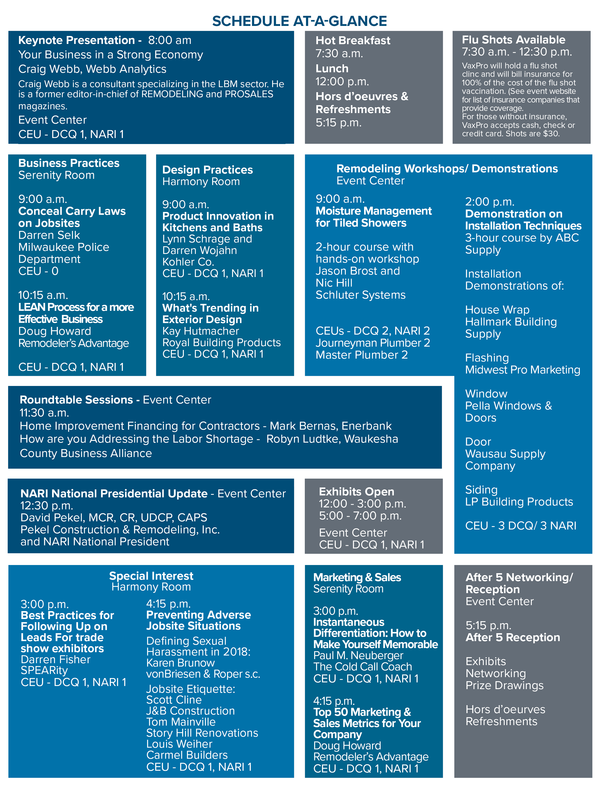 This presentation will focus on the basic practices and principles of LEAN and how they can be applied in the Remodeling industry to reduce slippage, and get projects done on time and on budget! A quick note from Guild Quality on a special opportunity. Join David Pekel, MCR, CR, UDCP, CAPS NARI National President during a lunch session as he gives a Presidential update. Do you exhibit in trade shows? In an ever-evolving consumer market, how do you follow up on your leads? Learn the Best Practices for Following up on leads in this exclusive session for those that participate in trade shows. One of the ultimate secrets to sales success is something that everyone is aware of, but very few people know how to execute on: differentiation. With so much competition in your space, how do you sound and act different? What is it that your company offers that no one else does? How do you communicate that message in a clear, concise, articulate manner within a few seconds to stand out from the crowd? Come to this session and find out! Preventing sexual harassment in your workplace requires more than having an updated policy in place. This presentation will help employers understand how to enforce workplace culture; develop processes to prevent claims; and how to effectively address claims that arise to minimize legal and operational vulnerabilities. In this era, companies need to be more aware than ever of their etiquette. Join this discussion and find out what it means to deliver great service to your customers. Marketing and Sales Metrics are critical to knowing what is working and what is not in terms of everything from websites to lead generation to closing sales. There are so many ways that marketing dollars can be spent and so many variables in the sales process that a company needs to be tracking, analyzing and acting on the right information to get the most out of this essential part of the business. This presentation will focus on what metrics to measure and how to measure them, analyze them and use them to develop strategy.